City Farm School (CFS) is ready to accept new applications for our Medicinal Herbs Apprenticeship program 2018! CFS is an urban agriculture learning program and food sovereignty organization aiming to empower the Montreal community through organic and locally grown produce. This program uses our Loyola medicinal herbs garden to teach apprentices about a variety of plants and their capacity for healing and wellness. In these courses, you will learn how to grow, use and transform a few local herbs over this introduction to herbalism course. Taking place at both Loyola City Farm School over the course of 6 months, students will learn the basics of how to grow, harvest, preserve, transform and apply some common herbs such as Yarrow, Raspberry Leaf, Lemon Balm, Marshmallow, Lavender, St-Johns Wort, Comfrey and more. We will also learn how to make, salves, balms, tinctures, throat lozenges, syrups and suppositories to just name a few. There will be courses on botany and plant identification, ethical practices in cultivation and wild-crafting, as well as introductory classes focused on physiology and phytochemistry. Best of all, apprentices get to learn by working with and caring for the plants each week! The Greenhouse’s house plant sale is back! Here at the Concordia Greenhouse, we pride ourselves in giving back to a community that keeps supporting us. One of the ways we bring a little more freshness into your life, is with our house plant sales. There’s so many options to choose from, you’re not going to be-leaf it! You can be sure to find something to fit your taste and beautify your space! Vivarium who are bringing kokedamas, Living Art and more! Kokedamas & Living Art are a creative way to incorporate plants into your home decor to change your living space up. You can also mix it up with some tropical fruit plants, or invest in an edible plant; the green gift that keeps on giving. Hydroflora Concordia – Hydroponically-grown plants. They will also be selling their cement planters made from recycled molds. Prices range from $5 to $50. Neumark Design providing edible house plants, herbs, fruit shrubs and other perennials. Prices range from $4 to $30, and we would love it if you could bring your own bags/boxes so we can keep the event as sustainable as possible! The City Farm School Apprenticeship Course is designed to create urban organic farmers interested in growing veggies for markets, while also working collectively to design and manage a typical scale community garden plot. This year we are offering the full season course, as well as the option to take any of the three distinct sessions of the Full season program. Beginning in early March, students will embark on an eight-month long apprenticeship that begins in our downtown greenhouse, moving out to our urban farm on the Loyola campus in late May and ending in early November. This program is ideal for someone thinking about applying for farm work outside of the city in the near future, but would like to sample the experience while remaining in the city. Want to start a project in the Greenhouse? Email us at info@concordiagreenhouse.com to learn more. Application for visiting projects – Download Here! There are several ways in which individuals or groups can work within the Greenhouse space, according to their project idea, requirements and needs. There is also a Board Discretionary Funding budget for projects that are looking for capital. Visiting projects are usually small-scale, experimental projects that may run from several weeks to an entire school year. 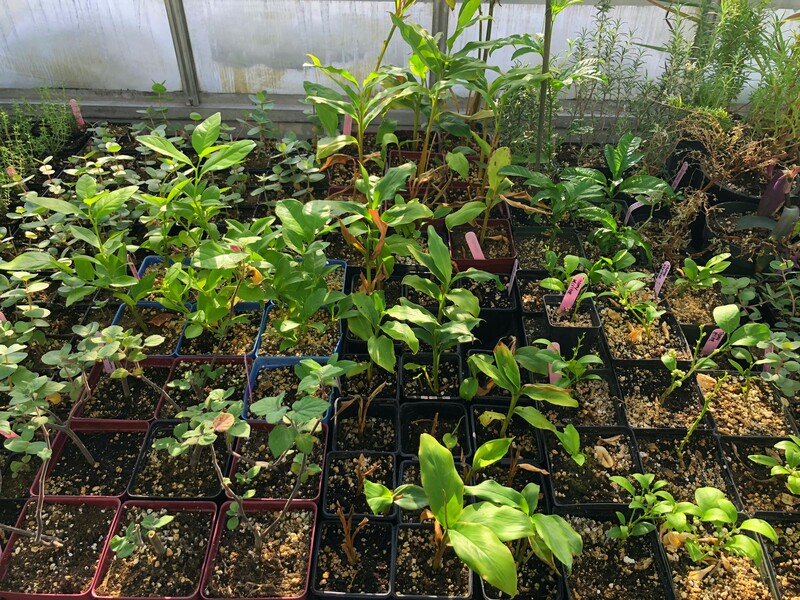 These projects run independently of the Greenhouse’s regular operations and an official request must be submitted to the Greenhouse Collective in order for the project to continue for longer than one school year. Furthermore, visiting projects can (and should) try to incorporate learning and volunteer opportunities for Greenhouse members. Visiting project groups can be comprised of both students and community members, with at least one current student per project. We encourage all projects to consider the Concordia Greenhouse mission and vision, including issues related to sustainability, urban agriculture, innovative ecological practices, educational models and Concordia community involvement. Each visiting project must have an appointed representative who will act as a main contact for the project. Projects must submit a summary report of the project no later than one month following the completion of their project, or by October 1st of each year for ongoing/long-term projects. Visiting projects do not share the Concordia Greenhouse budget, although they may request resources (financial or otherwise). Funding and fundraising needs must be clearly outlined in the project application, and will be assessed on a by-needs basis, according to the Greenhouse’s financial timeline. Please note that the Concordia Greenhouse sets its yearly budget in August, and a review and update is completed in January. Concordia Greenhouse Projects are internally run and fully integrated into the Greenhouse’s general operations and re-occur yearly. It is possible for a visiting project that is deemed to be successful and beneficial to the Concordia Greenhouse and its community to become a Concordia Greenhouse Project. If this were the case, staff members paid by the Concordia Greenhouse may be asked to join the Collective in order to take part in discussions and decisions to do with general Greenhouse operations in relation to the organization and the project. This decision would be made by the Collective and Board of Directors, following a request from a visiting project to be considered a Greenhouse Project. Although each project has its own organizational structure, the Concordia Greenhouse Constitution acts as a set of common guidelines and ethics for their organizational development and interpersonal relationships within the Greenhouse, and the community at large. All projects must adhere to Concordia Greenhouse hygiene and cleanup regulations. No chemical pesticides or fertilizers are permitted in the Greenhouse, however some exceptions can be negotiated with Greenhouse staff. Finally, all projects must mention the Concordia Greenhouse as a supporter and host site for the project’s implementation. Following the application review, the project representative will then be contacted within one month of the project submission. Applicants are welcome to request a meeting with a Collective member representative in order to discuss the application and the Collective’s decision. If the project is accepted, the project leader will be be invited to discuss the project in more detail with a Collective member prior to launching the project, and an contract must be signed by all parties. Applications for Board Discretionary funding are accepted throughout the year, but are reviewed on a quarterly basis. The Board will disperse a percentage of their fund at these reviews and projects can apply for up to 250$ per quarter. Completed applications can be submitted to the Greenhouse Collective in writing (Concordia Greenhouse office, 1455 de Maisonneuve W., H3G 1M8, 13th floor), or by email at info@concordiagreenhouse.com. Interested in food security, and growing your own food year-round using organic methods? The ​Concordia ​Greenhouse Project​ is looking for undergraduate​ students interested in taking the Internship in Sustainability credit LOYC 420 with for the Winter 2018 semester. During this internship, you would learn how to grow greens year long in a greenhouse context, focusing specifically on planting, harvesting, pest control, fertilization, packaging and deliveries. The internship requires 120 hours – to be completed between January 8th, 2017 and​ April 13th, 2017. ​This internship will build students’ experience with small business planning, food security and ecological growing methods. ​Experience working with plants an asset. If you are interested please send your CV and cover letter to Charleen Kotiuga at fourseasonsgrowing@concordiagreenhouse.com by Monday, December 11th at 5pm. Please contact Dr. Rebecca Tittler (rebecca.tittler@concordia.ca) for enrollment details. Note: This internship can be in conjunction with other internship programs (with department approval). The Concordia Greenhouse is looking for a Concordia student intern in the Communications program for an internship starting this semester! This internship will build students’ experience with graphic design, working with clients for design projects, event hosting, product creation and marketing, teamwork, newsletter editing, social media and more! Announcing our 2017-2018 Board of Directors! We would like to thank our 2016-2017 Board of Directors for the past year of work and welcome in our newly elected board! Welcome to the team! Looking forward to an exciting year ahead!